We're creating a buzz in Belgravia with our bee-friendly plants and flowers for a scented summer that will help save the planet in style. One of the many charms that I love about living and working in Belgravia is my early morning walk across Belgrave Square on my way to The Flower Lounge. Many of the trees, shrubs and plants thriving in this private garden supply the nectar and pollen so vital for the bees that are rapidly becoming an endangered species in the UK. Our Belgravia bees live in a few protected hives on the roof-tops of Grosvenor Estate's Belgravia and Mayfair; a project developed by Grosvenor entitled "Creating a Buzz." 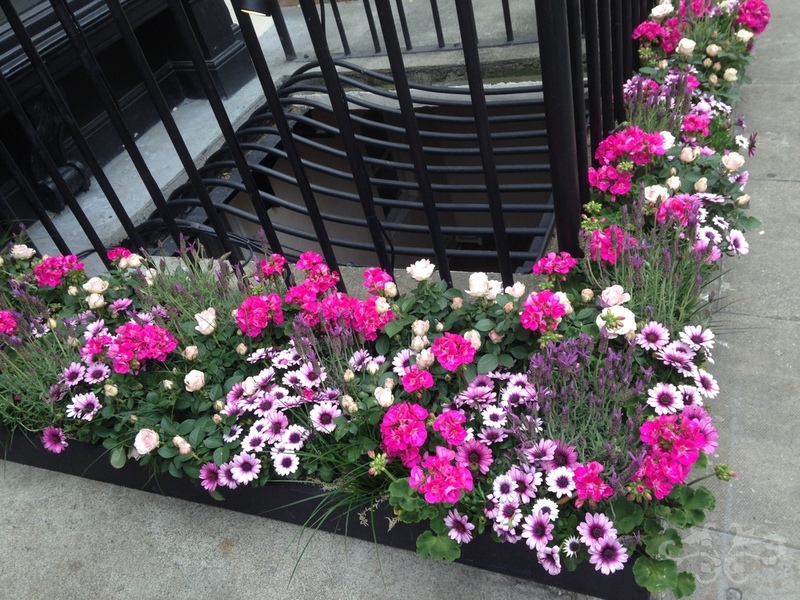 To support "Creating a Buzz," and In response to increasing demand from our Belgravia residents, we have introduced a new service : to create bespoke window boxes, hanging baskets or patio containers however large or small, with bee-friendly flowering plants to match any colour palette or style desired. 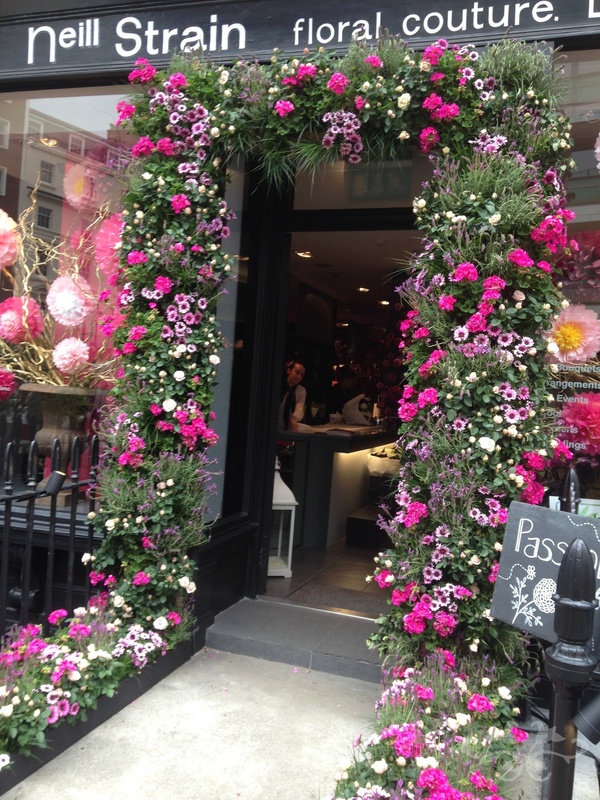 We introduced this service during the recent Chelsea Flower Show with our "Belgravia in Bloom" street display at The Flower Lounge where we installed window boxes and a "living wall" of a variety of plants ranging from Lavender for the bees, Geraniums for colour, Roses for the scent, Grasses for texture and Osteospermum for that extra chic ! They have existed for 40,000 years, dating as far back as the dinosaur era, and are believed to have originated in India. There are 3 types of bees : honey bees, bumblebees and solitary bees. While the latter live and work alone, the "social" honey bees live in colonies of up to 80,000, whereas the bumblebee nests will have at most 100-200 bees. The honey bees produce honey and the bumblebees are particularly important for pollination. All bees feed almost entirely from flowers or blossoms and need both nectar and pollen which they transport back to their nests to feed the larvae and their Queen. One Queen bee rules the nest; a Queen honey bee will lay 1,500 eggs per day and 200,000 eggs per year from spring to November. The female worker bees will visit hundreds of blossoms per day working non-stop, and protect the hive and their Queen, particularly during the winter months to keep her warm. They produce the honey which allows them to survive the winters. About 5 million flowers visited will create 1 pint of honey. Whereas honeybee colonies last for years, bumble bee colonies survive only one year. The Queen bumblebee's first eggs, fertilized from the previous autumn, are laid in the spring and produce the female worker bees who create the new nest and search for food (nectar and pollen). Following a few flights outside the nest to be fertilized in mid-air by the male bees, "drones," the Queen remains in the nest, laying eggs. She also produces a chemical which renders the other female bees infertile. 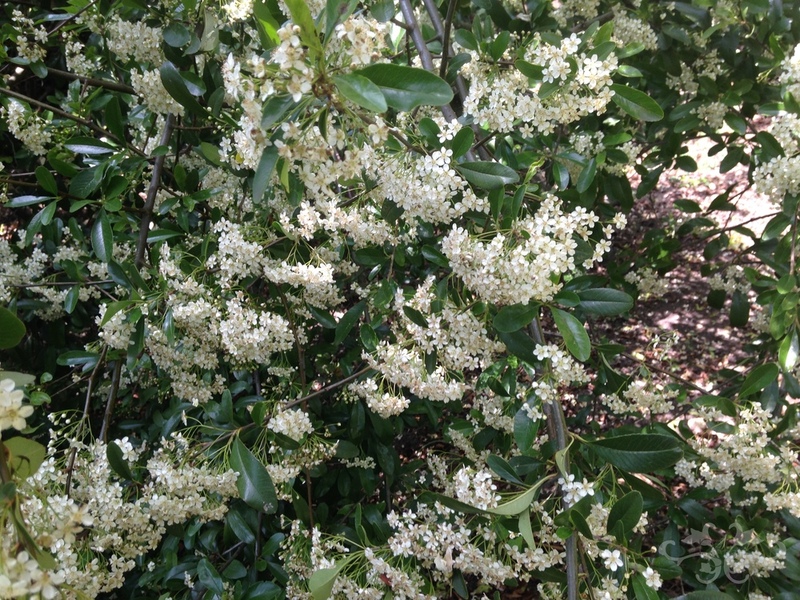 By late summer, a few male bee (drone) eggs are laid - male as they are unfertilized. The drones' sole purpose is to fertilize the future Queen bees; if they do, they die instantly afterwards, and if they don't they are forced out of the hive late autumn to die in the cold ! Not a very appealing life ! Note the female workers also die if they sting, so they will only do so when in severe danger. Later in the summer, the Queen bee no longer produces the chemical which prevents the female workers from laying eggs and, as such, by autumn, other eggs are laid and the Queen quickly destroys these by eating them, until the workers form a mutiny against her and sting her to death ! They then all die over the winter, except for the future Queen bees which hibernate in a warm shelter underground. All worker bees prefer to find nectar and pollen from blossoms or single flower types, not long tube-shaped or dense petaled flowers which don't facilitate their journey. Alliums, Aquilegia, Iris, Lilac, Lavender, Cosmos, Delphinium, Micheaelmas Daisy, Vibernum, Choisya, all wild flowers, fruit blossoms... the list is endless. In Britian the bumblebees are important for pollinating the commercial tomato and apple crops. Of 50 bumblebee species in the '30s, now only 25 survive; 97% of our flower-rich grassland has disappeared over these last 80 years allowing less food for the bees; mites and disease are killing off many, many hives. And the dangerously diminishing number of bees will eventually cause higher food costs (as crops will need to be manually pollinated) and even potential shortages.... A flowering plant cannot reproduce or create seeds if it has not been pollinated. Only grasses and some conifers in the U.K. can be pollinated by the wind without any help from insects. So with these facts in mind, we must thank the Grosvenor Estate for our Belgravia bees, and please join us at The Flower Lounge to create some gorgeous, bee-friendly plants for your windows, patios or roof-gardens, styled in the Neill Strain Floral Couture signature style of luxury and elegance, so we can keep our gardens beautiful and continue to eat well for many years to come !